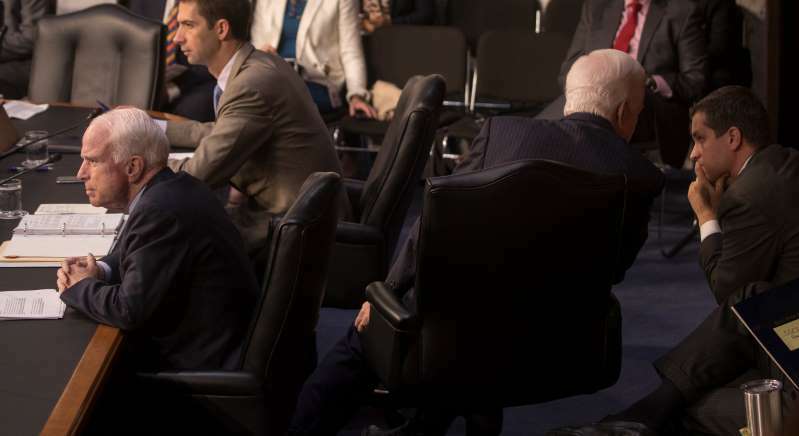 Senators John McCain, left, and Tom Cotton at a Senate hearing last year on Russian interference in the 2016 election. He was long reviled by Russia’s state-controlled media as a deranged warmonger. President Vladimir V. Putin said he had “lost his roof” — in other words, gone crazy — during his time in captivity in Vietnam. Despite, or rather because of, all the abuse, however, Senator John McCain will be sorely missed in Moscow. The beauty of “Russophobia” from Russia’s perspective is that it absolves Moscow of any responsibility for the consequences of its own actions — the annexation of Crimea, its military incursions into Georgia and eastern Ukraine, the shooting down of a Malaysian passenger jet and its repeated meddling in Western elections — and has turned the country into an innocent victim of, well, John McCain. But what to do now that, as Oleg Morozov, a member of the foreign affairs committee of the Duma, Russia’s upper house of Parliament, declared this week, “The enemy is dead”? Alexander Domrin, a Moscow academic and administrator of a Facebook page called “Russians for Donald Trump,” said he was “not sorry” that Mr. McCain had died, “because he was an enemy of my country,” but conceded that finding a replacement hate figure will not be easy. Apparently calculating that kicking a dead man looks bad, and unsure about how to make sense of the world now that the man supposedly responsible for so many of Russia’s troubles has gone, Russia’s state news media has in recent days somewhat muted its previously splenetic attacks on Mr. McCain and even given voice to what pass for tributes. The idea that Russia is besieged by irrational haters who, no matter what the country does, will always seek to kill off Russia and its people, has flitted on the fringe of Russian thinking since the 19th century. That’s when a Slavophile poet and diplomat, Fyodor Tyutchev, coined the term Russophobia — which he said had infected some prominent Russians and acquired a “pathological character” — in an 1867 letter, written in French, which he knew better than Russian, to his daughter. Soviet ideologues and propagandists mostly stayed away from the idea, preferring to blame the machinations of class enemies, foreign capitalists and imperialists for their country’s problems. But as faith in Marxism withered in the 1980s and Russian nationalism re-emerged as a potent force, interest in “Russophobia” resurfaced. The true flowering of “Russophobia” as a concept embraced not only by fringe nationalists but by the Russian state did not take place until the 2014 crisis in Ukraine. Russian officials and the state-controlled news media started using the term daily to explain why the West was protesting so loudly over the annexation of Crimea and Russia’s military intervention in eastern Ukraine. Accusations of Russian meddling in the 2016 United States presidential election gave the concept even more traction, with Foreign Minister Sergey V. Lavrov denouncing them as a “Russophobic instrument.” Russia’s 2017 sports doping scandal, which erupted after a whistle-blower provided all-but-incontrovertible evidence of illegal doping, was likewise dismissed as another outbreak of the West’s pathology. Throughout, Mr. McCain was cast as the principal source of all of this supposed hatred. That Mr. McCain was not a fan of President Putin and also a tireless supporter of his foes across the former Soviet Union, including the former Georgian president Mikheil Saakashvili, is beyond dispute. But his place at the center of Russian demonology stems not only from his long record of resisting what he saw as Russian aggression, but also from the Kremlin’s need to find a self-exculpatory explanation for why its relations with the West have soured so badly. The list, however, highlights how difficult it will be for Russia to find a substitute hate figure for Mr. McCain. The other “Russophobes” on the list — Hillary Clinton, the actor Morgan Freeman, a handful of journalists and a few other, mostly obscure, figures — are either has-beens or carry too little weight to step into Mr. McCain’s shoes as the plausible ringleader of what is supposed to be a global conspiracy.